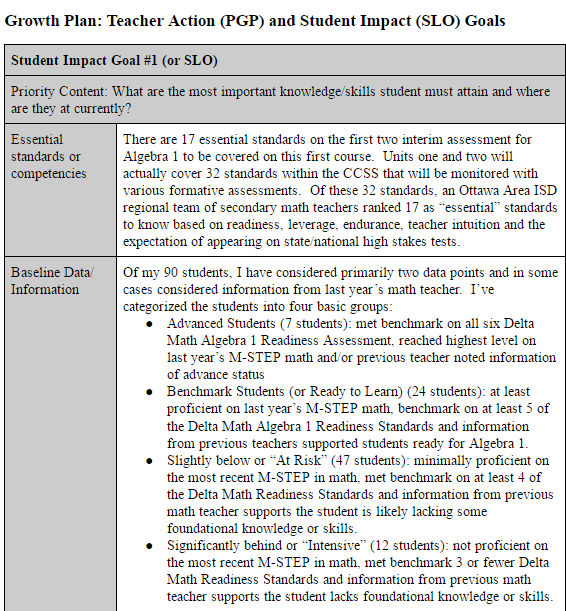 A collaborative initiative by superintendents across West Michigan to create a meaningful, simple and compliant process and documentation that will meet state law §1248 and §1249 on teacher performance goals and student growth for educator evaluations. The end result was a S.M.A.R.T. 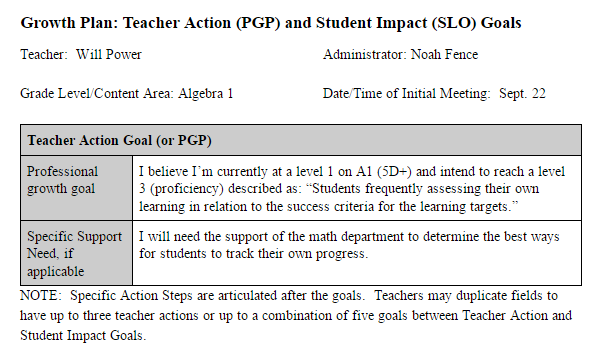 Growth Plan that has two sections: Teacher Action Goal(s) and Student Impact Goals. Also, a list of definitions was created to support the concept of Growth Plans. This page contains a general overview of the two sections (Teacher Action and Student Impact), click the orange button for additional guidance under either section. 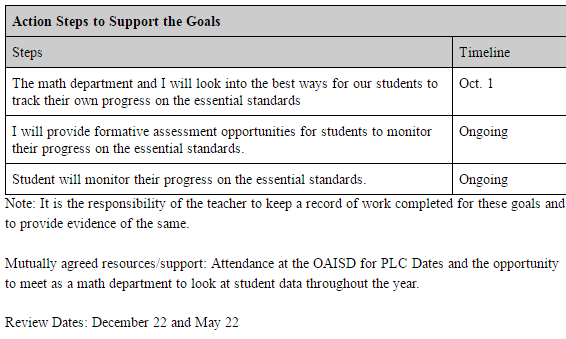 Several districts have implemented a policy for assigning a teacher a "Plan of Assistance." Basically, the administrator feels there is sufficient evidence to recommend a plan of action and set particular growth goals for a teacher. This can be done for any teacher, including "Effective" Teachers who may have one area needing significant improvement. The simplicity of this system is that ALL teachers complete a Growth Plan that is generated by the teacher and approved by the administration. ANY teacher who is assigned a "Plan of Assistance" by an administrator meets the requirement of the law for an "Individual Developmental Plan (IDP)" when districts simply define an IDP = Growth Plan + Plan of Assistance. Therefore, any teacher below "Effective" must be assigned a "Plan of Assistance" which may simply be district initiatives a new teacher likely missed in recent years. Priority Content: What are the most important knowledge/skills students must attain? 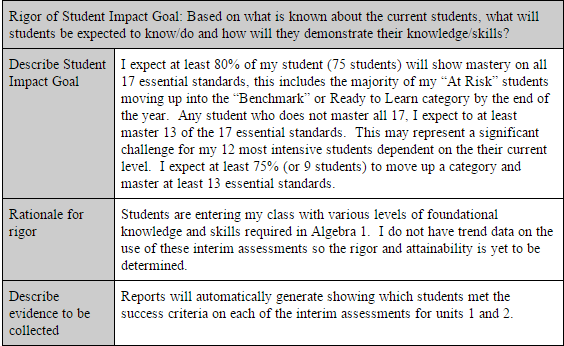 Rigor of Student Impact Goal (or Rigor of Target): Based on what is known about the current students, what will they be expected to know/do and how will they demonstrate their knowledge/skills? See a sample Power Point for introducing to teachers. Algebra 1 folder (minimally compliant, mid-size and thoroughly complete). A tour of the Google Drive Folder, including how to make your own copy of the materials will be coming soon.